If you’ve been craving high-intensity rummy online action, you’ve hit up the right rummy site. Deccan Rummy has all that you could ask for in a rummy site – exciting tournaments, awesome promotions or action packed games. 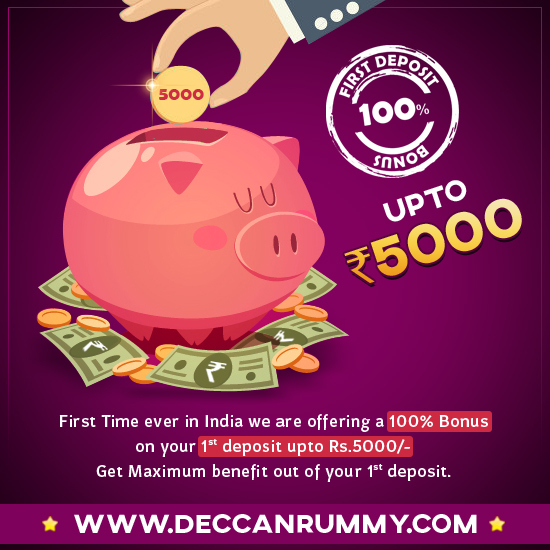 Deccan Rummy has become synonymous with offers and promotions. We make sure you relish every moment you spend with us and take back only pleasant memories. The myriad of offers existing in our website allows you to maximize your earnings. Online rummy players choose a site after considering so many factors – bonus the being primary. DeccanRummy has never failed to satisfy our customers in this aspect. Almost every rummy site on the web offer a first deposit but not all bonuses are as effective as it seems. At DeccanRummy, we’ve worked painstakingly hard to create a bonus scheme tailor made to rummy hungry players on our site. To mean we are into serious business, we are offering our new registrants an option to earn 100% bonus on their first deposits, up to Rs. 5000. Your first deposit is going to multiply hugely to epic proportions. Now deposit to your account and we are going to reload the same amount to your account. How the Deposit & Reload Bonus works? As mentioned, you will be entitled to 100% bonus on your first deposit with the bonus amount capped at Rs. 5000. On the other hand if you deposit Rs. 7000 you will receive Rs. 5000 as the bonus amount is capped at Rs. 5000. When you make a deposit, the bonus amount will be converted to points at the rate of Rs. 100 = 1000 Deposit Bonus Points instantly. Once you start playing cash games, the bonus amount will move gradually to Pending Bonus column available next to Total Bonus Points column. Bonus Amount can be redeemed only when the points move to Pending Bonus column. Enter the number of bonus points that you wish to redeem by entering the bonus points in the column below and click on Redeem. The amount will be automatically credited to your Decccan Rummy account balance. Note: Please note that a minimum of 1000 Bonus Points is required to process any redemption. As the offer is applicable only on the first deposit in your account, make sure you deposit big to earn a big bonus. Hit a home run using this offer. People have been agile to make use of the promotion to their fullest advantage ever since we launched this promotion. A loud shout to players who haven’t made a deposit – Do not miss this wonderful opportunity to multiply your money! Make use of the deposit before it becomes void. Keep playing rummy with Deccan Rummy and watch this space – lots of astounding Rummy promotions are around the corner. We also have many astounding rummy tournaments like goldquest through which you can win gold coins. The offer is valid only on the 1st Deposit made by the player to his account. Any subsequent deposits will not be considered for this promotion. Any player found trying to misuse this offer by creating multiple accounts etc will have to forfeit bonus amount and could also be barred from playing on the site. What Online Rummy Players said about Deccan Rummy?